Where to scallop in Florida – There are numerous wonderful places where you can scallop in Florida. Homosassa, Crystal River, Steinhatchee, Keaton Beach, Port St. Joe and Cape San Blas are some of the more popular destinations. 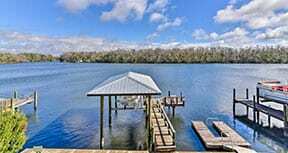 However, there are many beautiful, secluded places where you can scallop that stretch along the west coast of Florida. 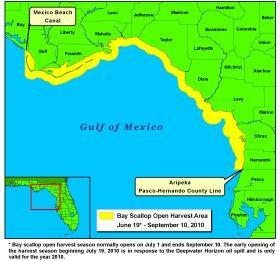 In Florida, the waters in the Gulf of Mexico that are open to scallop harvest extend from the Pasco-Hernando County line (near Aripeka – latitude 28 degrees, 26.016 minutes North) to the west bank of the Mexico Beach Canal in Bay County (longitude 85 degrees, 25.84 minutes West). It is illegal to possess scallops any waters outside the open harvest areas. It is also illegal to bring scallops to shore outside open harvest areas. For example, it would be legal to take scallops from waters off Homosassa, but it would be illegal to dock your boat in Pasco County with your scallop catch on-board. See the map below outlining the legal harvest areas. When planning your scalloping trip, make sure to check out the local area you have decided on for your adventure. Helpful guides on where go scalloping in Florida featuring the most popular scallop destinations are included on this site. Each area has listings of scallop charter boats, places to stay, maps to area boat ramps, information on marinas, where to get your scallops cleaned, dive shops and more. If you have any questions about scalloping or where to scalloping in Florida, feel free to post them on our facebook page or contact us. Scalloping season is just around the corner so plan your trip early. After your scalloping trip, don’t forget to post your pictures and videos on the Scallop Hunter facebook page.